Want to know more about Southern Idaho, Or select a region, area or city you want to study further. Smiling service in Idaho if you need a TRADESMAN, a Plumper - Carpenter, You'll also find a Handyman . - Is your car or home for sale, Looking for an apartment or cottage? - You'll find it here. News and debateSouthern Idaho and Idaho. You can also find Motels - Restaurants - Bed and Breakfast - Dining Guide ect. or read more about Southern Idaho. Idaho is a State in United States. - Visit Idaho and discover a land of beautiful and varied scenery, the people of Idaho are very friendly and no matter where you are, you meet always a friendly smile.In urban and rural areas, you will be welcomed with a special friendly atmosphere. Many people don’t know much about Idaho except "famous potatoes." But, since you Visit Idaho, you would probably like to know more. Adjacent to Washington and Oregon in the Pacific Northwest, Idaho is a big state. It’s been said if you flatten all the mountains in Idaho, the state would be the size of Texas. Idaho covers two time zones, runs from Canada to Nevada, and encompasses the western side of the continental divide of the Rocky Mountains. Rivers, mountains and farmland dominate the state’s landscape. The panhandle has emerald green hillsides, timbered mountains and pristine lakes. Central Idaho is covered with jagged peaks. The Snake River Plain, with its wide open vistas, irrigated farm lands and vibrant cities forms the character of Southern Idaho. The mountain state of Idaho (a name that probably comes from an Indian word meaning "mountain precious stone") lies in the northwestern United States. The northern two-thirds of the state, the most mountainous part, are on the western slope of the northern Rockies, whose highest peaks here rise above 10,000 ft and offer excellent conditions for winter sports. Central Idaho, which includes the plateau of the Clearwater Mountains and Salmon River Mountains, merges in the south and southwest into the arid, steppe-like Snake River plain, along the edge of which flows the Snake River, in a valley which at some points is deeply indented. The climate is dry in summer. More than 40per cent of Idaho, particularly in the north and center, is covered with coniferous forests. History In 1805 Meriwether Lewis and William Clark traveled through the territory that is now Idaho and opened it up to white settlement. Originally part of the neutral territory of Oregon, it passed in 1846 into the possession of the United States. Large numbers of settlers heading for the northwest coast passed through the area, in which regular settlement began only in 1860. An independent territory from 1863, it was the scene in 1877 and 1879 of fierce fighting between whites and Indians, culminating in the flight of the Nez Perce Indians led by Chief Joseph. On July 3rd 1890 Idaho joined the Union as the 43rd state. The main element in the economy of Idaho is agriculture. In the mountainous parts of the state sheep and cattle are reared and on the irrigated Snake River Plains fodder plants, grain, vegetables, fruit and potatoes - Idaho is the largest potato producer in the United States, a fact proudly proclaimed on every numberplate ("Land of Famous Potatoes"). Agriculture and the huge areas of forest provide the raw materials for the foodstuffs and woodworking industries. The mining district of Coeur d'Alene in northern Idaho has the United States' richest reserves of silver, zinc and lead ores. Tourism also makes a major contribution to Idaho's economy, thanks to its beautiful forests and lakes and the winter sports centers of which Sun Valley and Schweitzer are the largest. The little town of Blackfoot in the south east, one of the main centers in the potato-growing area, hosts the World Potato Exhibition. In the center of the state's capital Boise, originally a French foundation, is the State Capitol. Other features of interest are the Ann Morrison Memorial Park, the romantic Platt Gardens and above all the Julia Davis Park, in which are the Zoo, the State Historical Museum and the Boise Art Museum. Of particular interest is the Basque Museum and Cultural Center - Boise has the largest Basque community in the United States. Outside the town to the south is the World Center for Birds of Prey. Idaho’s history lies with its native tribes, the Lewis and Clark Expedition and determined pioneers on the Oregon Trail. Today’s Idaho is both cosmopolitan and small-town friendly. Boise, the capital and largest city, developed near Fort Boise along the Oregon Trail has grown to a population of 190,000. Agriculture, manufacturing and tourism are Idaho’s major industries. Abundant outdoor recreation opportunities and scenic vistas around every turn attract over 20 million tourists annually. Whichever part of this magnificent state you choose to discover, you’ll find spectacular scenery, fun things to do and friendly, helpful people. You’ll also find a place that’s unhurried, unspoiled and unassuming. So linger awhile and discover Idaho. Boise City is a city located in the Northwestern United States in the state of Idaho. 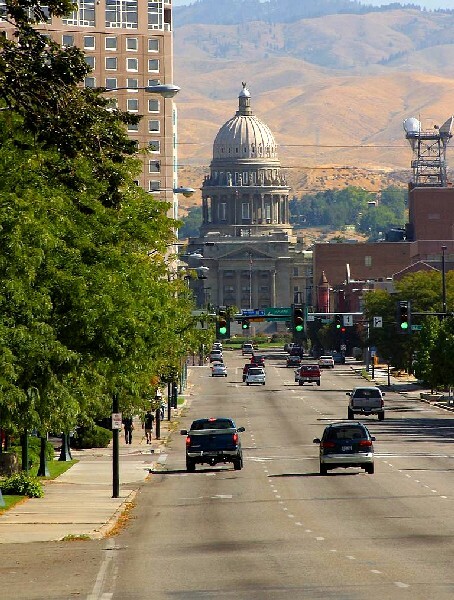 Boise is the capital and most populous city of the U.S. state of Idaho as well as the county seat of Ada County. Located on the Boise River, this is the principal city of the Boise City-Nampa metropolitan area and the largest city between Salt Lake City, Utah and Portland, Oregon. As of the 2008 Census Bureau estimates, Boise s city population was 205,314 and Boise metropolitan area is estimated to have 599,753 inhabitants, by far the most populous metropolitan area in Idaho. It is also the 100th largest US city by population. Our Vision: To Make Boise the Most Livable City in the Country. David H. Bieter, Mayor Welcome to the City of Trees. Whether you re a resident, a business owner, a visitor or thinking of making Boise your home, we are here to provide you with outstanding municipal services - a vital part of any great community s quality of life. Boise possesses an independence and creative spirit not found in many other places. With our stunning scenery, abundant natural resources and year-round outdoor activities, it s no surprise Boise consistently lands on national "best places" lists for families, businesses and recreation year after year. We place the highest priority on integrity in government, economic development and delivering services at the neighborhood level. It s all part of our vision of making Boise the most livable city in the country. Please let us know how we re doing. Idaho is famous for its inspiring mountain settings and commanding rivers. Bounded on all sides by land, it shares its western borders with Washington and Oregon and its northern tip with the lush, fertile farmlands of eastern British Columbia. Montana and Wyoming define its eastern mountainous border, while Nevada and Utah make up the southern edges of the state. Idaho’s major cities include Boise in the southwest, Idaho Falls in the southeast and Coeur d’Alene, Idaho’s largest northern city. All are reachable by interstate highway. As is true in most of the Northwest, summer and early fall are the best times to experience Idaho’s sunny weather and many seasonal festivals. Visit the only authentic 1880 s underground gold mine museum in the Northwest! This mine was worked from 1879 to 1881 and was only rediscovered in 1991. A guided underground tour explains how miners drilled, traced veins and tested for gold. Underground mine tours, museum and gift shop are open all year with seasonal gold panning. This is a AAA-approved attraction with an RV Park on site. Tour buses are welcome. In the heart of Southeastern Idaho, on the banks of the Snake River and the shores of the American Falls Reservoir, the City of American Falls and its 4100 inhabitants enjoy the rich heritage and history of westward expansion of the United States. Originally settled as a supply stop along the Oregon Trail, American Falls is now a commercial center with access to the Union Pacific railroad and Interstate 86. The city is located just 23 miles west of Pocatello, a growing city of 50,000 featuring Idaho State University, major retail centers and a growing high tech sector. The economy is dominated by agriculture, particularly the growing of sugar beets and famous Idaho potatoes. In addition. a variety of light manufacturing facilities are located throughout Power County. Outdoor recreational activities abound. The Snake River and the Reservoir offer many opportunities for boating and fishing. The Willow Bay Marina complex offers camping, boat launch facilities and a cafe. Massacre Rocks State Park, just 10 miles west on I-86, provides camping, river access, hiking and fishing. Bird watchers find the area to be a prime site for the year-round observing of a variety of birds at all times of the year, particularly during the Spring migration. The city operates a challenging 9 hole golf course. Until 1925, the city was located adjacent to a series of cascading falls. In 1927, the new American Falls Dam was completed by the Bureau of Reclamation, creating the largest of what would be six major water storage facilities along the Snake River. The city had to be moved up the hill to escape the rising waters of the new reservoir. Late in the summer, following significant water withdrawal for irrigation, the foundations of the "old town" are clearly visible. The American Falls School District Idaho consists of two elementary schools, a middle school, and a fabulous high school complex built in 2002. The high school features a state-of-the-art auditorium which is used throughout the year for a variety of musical and theatrical events in Idaho. American Falls Idaho is home to Power County s offices and courthouse, County EMS, Harms Memorial Hospital, Power County Nursing Home and the Public library. The Power County Press is published each Wednesday. Residents of the city enjoy the mild high-desert climate, with warm summer days and cool nights. Annual rainfall averages about 9 inches. For winter sports enthusiasts, excellent skiing and snowmobiling is found in nearby towns of Rockland Idaho and Arbon, with Jackson Hole, Sun Valley Idaho, Pebble Creek and visit Pomerelle within a 3 hour drive. In addition, Visit Yellowstone National Park Idaho, Visit Teton National Park Idaho and Visit Craters of the Moon National Monument Idaho are also just a few short hours away.